PLEASE NOTE: This is the entire unedited article I wrote for the May 2017 issue of Montana Magazine along with all of the Montana photos and photos of travel photos that appeared in that article. Now that Montana Magazine has closed its doors, I will be publish here all of the articles I have written for them in the past. There are many ways to travel between Yellowstone National Park and Glacier National Park. And none of them are poor choices. Though each offers travelers something different. Clearly the most common route between Montana’s two most popular tourist destinations includes the interstate highway system. Those who travel between the two national parks and use only I-90 and I-15 can cover the 380 miles between the two parks in little more than seven or eight hours. Not bad if you are in hurry, but you are sure to miss out a lot in-between that has made Montana the coveted travel destination it is. Most of the other logical paths between Yellowstone and Glacier are wrought with steep grades. As such, these routes mat not be attractive option, especially if they are tugging an RV like so many do when visiting the national parks. Others simply don’t like the idea of driving on steep, mountainous highways. If either of these are reasons for you to avoid other paths, or if you just want to experience Montana in a whole new way, then you really only have one other choice. And my, what a wonderful choice it is. Big Timber is easy to get to if you are leaving Yellowstone National Park. It is a quick drive east on I-90 from Livingston. Located in the heart of Sweet Grass County, Big Timber is located in the shadow of the beautiful Crazy Mountains. It is also located in the heart of what is arguably the fly fishing capital of the world where the Yellowstone and Boulder Rivers meet. The Big Timber community has many more things to see and do than the typical small western spot on the map. It has a beautiful historic hotel, ample recreational opportunities, lots of wildlife, and many of the more urbane pleasures to enjoy, too. While Big Timber may lack many of the big-name hotel chains and restaurants, it more than makes up with its quintessential Montana hospitality and flavor. Just south of Big Timber on Highway 298 is the spectacular Boulder Valley, which offers many opportunities for outdoor recreation, fishing, and a chance to see spectacular natural wonders. If you take the brief 25-minute drive south you can see one of Montana’s natural wonders, Natural Bridge Falls. There are several viewing points to view the falls. And often you will have the falls all to yourself…unless you consider the many deer, bears, elk, and small animals who also frequent the falls unwelcomed visitors. Spring is the best time to visit Natural Bridge Falls when you will see three separate falls. If you enjoy hiking consider a trek along the Green Mountain trail, which is a beautiful trip through the woods and it is often lined with beautiful wildflowers in the spring and summer. Just up the road from the Natural Bridge Falls near Box Canyon is a rocky bit called Lions Head. Indian caves with pictographs are an easy hike from there to the nearby Main Boulder Ranger Station. And an old ghost town called Independence is just an hour or two hike beyond Box Canyon. Abandoned buildings belonging to this former mining town are nestled along a beautiful mountain valley and are well worth the effort getting there. Independence is also accessible with a 4x4 vehicle on dry days, but it is recommended you check in with the local Forest Service office before doing so. Back in Big Timber and after a long day of exploring there are plenty of wonderful restaurants that await your arrival. Perhaps the most luxurious is located in The Grand Hotel. It features a wonderful Montana flavored menu, which changes frequently. Trout, Montana grass fed beef, and buffalo are mainstays. If you want something less sophisticated, then you must try the Thirsty Turtle. More of a bar than restaurant, the cooks there really know how to make a burger. I know that can be said about a lot of places, but it is honestly true at the Thirsty Turtle. Their burgers are fresh and cooked to perfection. And if you are from out of town you are likely to end up in a conversation with local residents there who are anxious to make you feel right at home. If you have more of a hankering for pizza, then Big Timber also has that covered, too. Iron Star Pizza is one of the best pizza joints in the entire state. And be sure to also try their deep-fried ravioli. Before leaving Big Timber, I recommend visiting the Crazy Mountain Museum, and some of the village’s galleries, including Hodges Fine Art Gallery and Two Rivers Gallery. And if you time your visit just right to Big Timber, be sure to check out their Sweet Grass Fest and Rodeo in late June and the Sweet Grass County Fair in late July. Heading north there are a few stops worthy of your attention. One offers a beautiful morning view of the majestic Crazy Mountains. Drive north on Highway 191 from Big Timber over the bridge and take the first right. Within a mile or two you will drive past the Otter Creek Fishing Access Site, which is a great fishing hole on the Yellowstone River. A few more miles down the road will meet Rapelje Road. Turn left and about two miles later you will find pull off on the west side of the road. From there you can watch the sun paint the Crazy Mountains a beautiful shade of orange in the morning. Continuing north you will drive past a buffalo ranch, where the woolly beasts will dot the plains and remind you of another time when these creatures could be seen from one horizon to the other. Another 18 or so miles north and you will come to Highway 371, or Melville Road. If you turn left and you will be glad you did. Melville was named in 1877 for Colonel George W. Melville, the great American arctic explorer. It is in the heart of cow and sheep country and was originally settled by Norwegian immigrants. Montana’s first Lutheran church is just west of Melville a few miles and it stands alone with the magnificent Crazy Mountains as its backdrop. It is a wonderful opportunity to take a photo to be sure. Continuing north on Highway 191 you will arrive on the outskirts of Harlowton, which after a long day of exploring the area you may consider this beautiful rural Montana hamlet the perfect place to stop for the night, especially if you are pulling a RV. Chief Joseph Park in Harlowton is the deal of the century. While the city park does not offer Wi-Fi or sewer, $15 will get you a nice clean campsite for the night and 30-amp electrical service. There is also a single water faucet near the entrance when you arrive. If you need to dump your tanks you can do so in town at Snowy Mountain Trading Post for a small fee. There are also excellent opportunities to camp at Deadman's Basin, which is just 20 minutes east of Harlowton. Deadman’s Basin has group shelters, a boat launch, trash cans, grills and fire rings, picnic tables, and toilets. Deadman’s Basin is also a great place for fishing. Out-of-state license plates are a rarity there; it is a hidden treasure frequented mostly by locals who are in the know. There are no fees at Deadman's Basin. As you drive north from Harlowton on Highway 191 will pass through the middle of the Judith Gap Wind Farm. And while the wind farm is not a destination per se, it is a striking feature on Montana’s rural landscape. 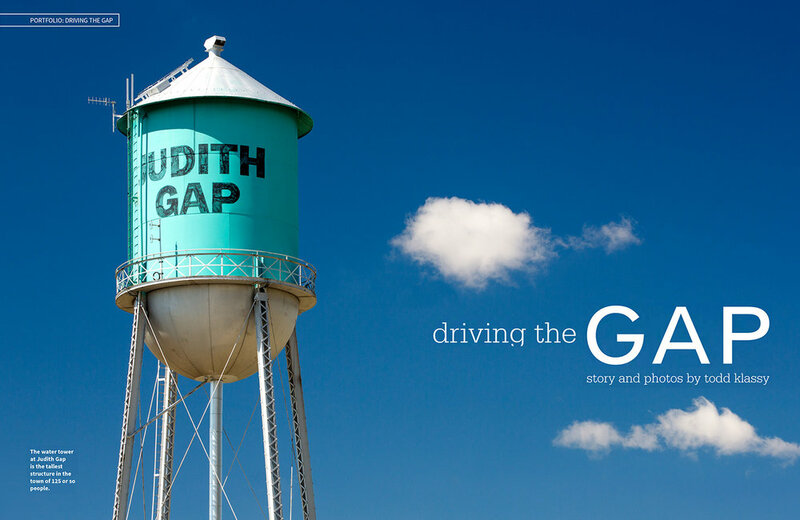 Another 30 minutes to the north and you will arrive in the small town of Judith Gap. Be sure to stop at the Hitching Post Cafe & Bar. Along with its great food the Hitching Post also has some of the best ice cream shakes in all the land…I kid you not. From there drive 10 miles north to Buffalo Canyon Road and take a left to see a beautiful old ghost town. There you can see abandoned old buildings, including an old bank, which was abandoned during the Great Depression, and an old brick school closed for good many years later. 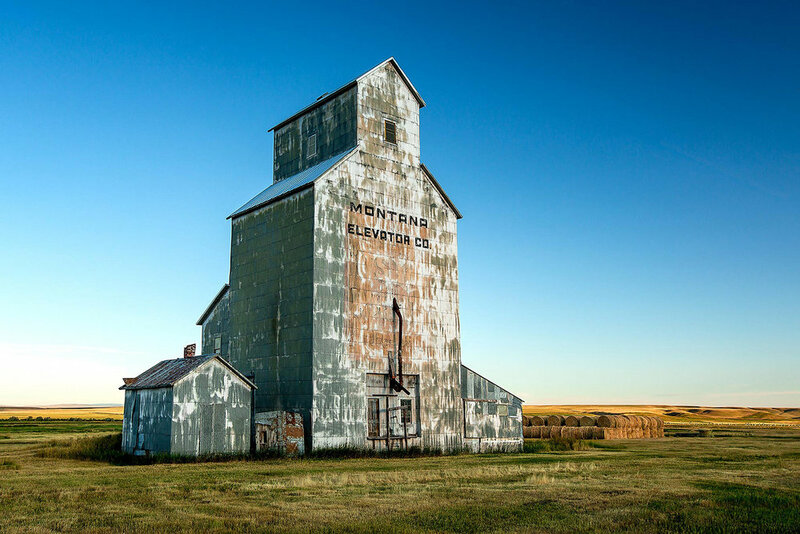 Another five miles north and on your left is one of the most beautiful old grain elevators still standing in Montana. 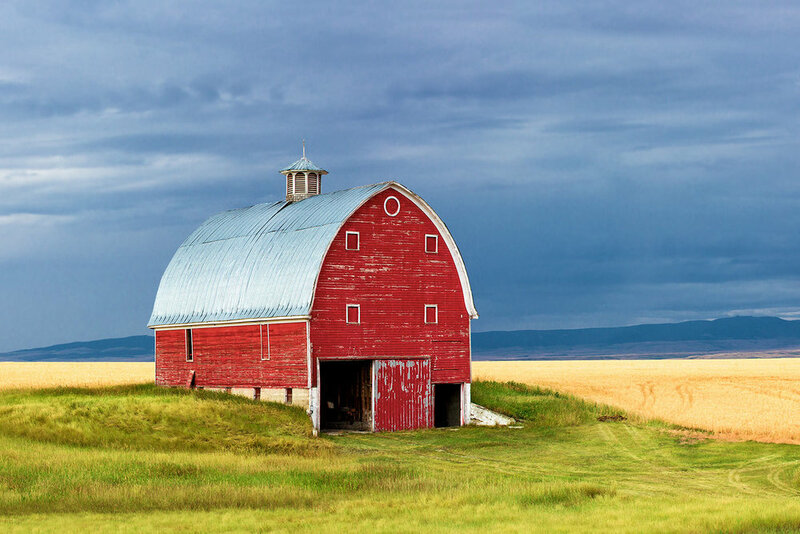 It is located in a place once called Straw, Montana. If your thing is photography it is well worth the stop. Further up the road is another old grain elevator on the left-hand side of the road worth a look, too. At the end of “The Gap” is a place well known to most Montanans. In business since 1951, Eddie's Corner owes its existence to its fortunate location. Located at the intersection of U.S. Highway 191 and U.S. Highway 87, Eddies' Corner is an oasis in every sense of the word. RVers will also be glad to know that Eddie's has some inexpensive campsites with full hookups, too. Or you can park overnight for free in their large parking lot. Other options include staying at the nearby Ackley Lake State Park or exploring the dozen or more campgrounds on the eastern face of the nearby Little Belt Mountains. Eddie’s Corner serves food around the clock, but its breakfast is best. And before leaving for Great Falls and continuing your way to Glacier National Park be sure to stop at Big Sky Grocery a few hundred feet west from Eddie’s Corner. This Amish country store has a smorgasbord of produce, old-fashioned goods, pickles, jams, jellies, hand rolled butter, cheese curds, and many dozens of different cheeses seldom seen outside the Midwest. “The Gap” is truly one of my favorite routes through the center of Montana. Surrounded by mountain ranges and rich agricultural land. This is the place that captured the heart of the legendary Western artist Charlie Russell a hundred or more years ago. And maybe “The Gap” will capture your heart, too.